Lucy would like to thank those of you who said that they would send her Wildside Salmon if they won the lottery. I was considering mentioning in yesterday’s blog post that getting her an unlimited supply of Wildside Salmon would be a priority should I win the lottery. But then I remembered that I already get her an unlimited supply of Wildside Salmon. Aside: Lucy loves Wildside Salmon. She is a finicky little girl, refusing most kitty treats. But she has never turned down Wildside Salmon, and goes so far as to specifically ask for it every day. Loudly. It was fun to read all the comments about what you’d do if you won the lottery. Daydreaming about a big lottery win is one of my favorite pastimes. We always thought this was hilarious. But you probably had to be there. Several of you asked what I’d like my WendyKnits colorway of Wollmeise to be like. I’m torn between having a mix of greens and browns, like my Loopy Legends colorway, Wendy’s Ferns & Toadstools, or a Lucy colorway, like Blue Moon Fiber Arts’ Lucy. Heck, I say we get two WendyKnits colorways! But until that time, I’ll just knit what I’ve got. Speaking of knitting what I’ve got, here is the shawl-in-progress. I’m thinking I’m going to do at least two more 32-row pattern repeats before I start the 42-row edging. That’ll give me a good 40 rows more than I usually do for a triangular shawl, but I don’t think I want to block this too severely. I like the way the motif looks just slightly stretched. Also, the intended recipient is tall, so she needs a long shawl. And in the meantime, I’m chomping at the bit to start a new project. I’ve got yarn and pattern in mind. But I won’t allow myself to start it until I finish this shawl. 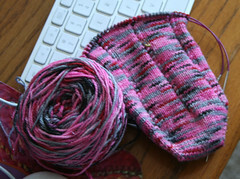 And here, just because Johanne asked, a picture of the second Alana sock in progress. Oh, and I almost forgot . . . Thank you everyone who emailed an entry. While I don’t have time to respond to 1317 emails, I do read them all! I wish I had Wollmeise for all of you. Congrats to Lani! Reading her blog, I’m happy she won. Thanks for holding the contest, Wendy. What a peach. Congrats to Lani!! I cant wait to see what you end up knitting outa the Lucy STR yarn, its purrrty…just like Miss Lucy herself! thank you for having contests for us. since i dont play the real lottery for religious/moral reasons, i consider being able to enter blog contests as much of a lottery as i feel comfortable with. maybe one day! Honey, if you had Wollmeise for all of us you wouldn’t HAVE to win the lottery! My 3 kitties would like to thank Lucy for the Wildside Salmon treat suggestion. They too are very finicky about treats. I’d be happy to find something they like. 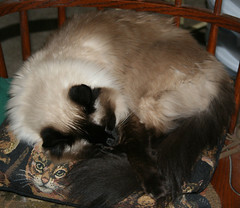 Although my Ragdoll, Twyla Twinkle Berry, already is very vocal in her requests. (I don’t know if I want to encourage her to “talk at me” more). Love your Alana socks. The colors and pattern are very pretty. Happy Spring to you and Lucy! : ) Must make a note of Wildside Salmon treats – my mom’s cat might like to try them out. If I won the lottery, I would get myself a permanent suite at a fancy hotel. That way there would always be people around to cater to my every whim. Want a snack? Call room service. Need a cab, call the concierge. need someone to do heavy lifting? Porter! Lucky Lani 🙂 Wendy, I like that you’re doing the shawl bigger. My knitting group has taken to calling some of the patterns showing up in magazines lately “shawlettes” because they seem a bit more like scarves than actual shawls you can cover up with. I wish more designers would note how to enlarge their shawl patterns (some are obvious, but some require more complicated math to match up the different patterns and it would just be easier to tell us). Happy Spring & Happy Easter! Blimey – 1317 posts! Thanks for running the contest, Wendy – and I think Lani ought to enter the lottery since her luck is obviously IN! 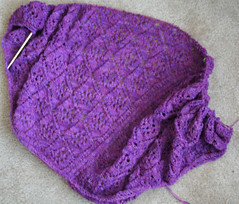 You are being very good not to start anything until the shawl is finished! I’ve had startitis really bad this month. Oh, I like the Lucy yarn from Blue Moon. I like the surprise of blue and green amidst the neutral colors. Congratulations, Lani, and thank you for the contest, Wendy. The shawl is lovely. Happy Spring to you, too! And congratulations to Lani! The shawl is gorgeous. You are so disciplined about finishing up one project before starting another. I try to remember this when something in the stash starts screaming at me to Cast On Now! I’m trying to imagine what it’s like to have a finicky animal in the house—between the dog and the teenagers, nothing is safe around here…. Yay!! Thank you so much Wendy!! 🙂 You’ve made my Easter weekend!!! I do like both your colorway at the Loopy Ewe and Lucy’s colorway at BMFA… Maybe a colorway that combined all four colors would be good? Blog contests are always fun even if I never win anything ^_^. I always end up finding a new blog from the winners. It’s a great way to find more interesting people interested in knitting or spinning! I love your Alana socks, both the pattern & the colorway! I haven’t seen that one on TLE, at least not with the silver strand in it. I hope Sheri gets more in, sometime soon! Happy Spring, at least according to the calendar. Although, it would be hard to convince many of us here in Michigan that it is Spring. This has been one very long, snowy, and cold winter, the longest one that most of us can remember. Usually, we have had a “breath of fresh air”, that is a spell with temps at least in the high 50’s, but often in the 60’s or 70, but no such luck this year. Anyway, I hope everyone has a great Spring, when it comes your way!